Mr. Eddie Stapleton, 46, of Canton, passed away Wednesday, September 11, 2013 at Heritage Hospice. Funeral services are scheduled for 1:00pm on Saturday, September 14, 2013 at the Sosebee Memorial Chapel with Deacon Lawrence Parker officiating. Interment will follow in the Old Macedonia Cemetery. The family will receive friends at the funeral home on Friday from 5:00pm until 9:00pm and on Saturday from 11:00am until the funeral hour. 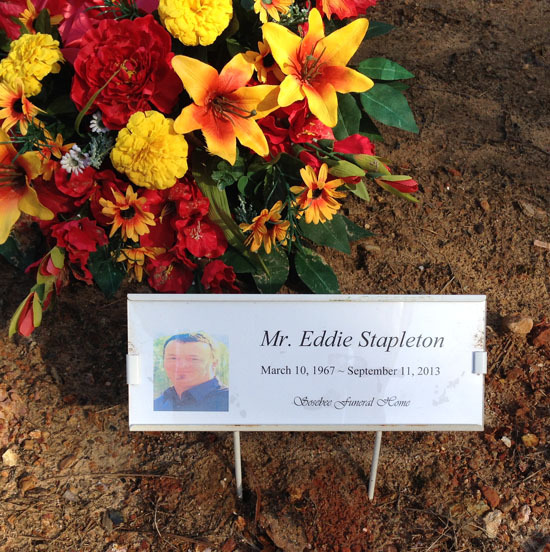 Eddie was a Bus Mechanic for the Cherokee County Board of Education. He loved fishing, hunting and motorcycles. He is preceded in death by his mother, Sam Pendery; father, Harold Stapleton; and niece, Janelle Hunnius. Survivors include his wife, Sherri Stapleton of Canton; children, Vincent (Fiance, Alex) Stapleton of Jasper and Krista Stapleton of Canton; sisters, Magi Ingram of Kennesaw and Courtney White of Blue Springs, MO; step-father, Parrish Pendery; nieces, Ansley Ingram and Vanessa Stephens; and nephew, Steele Ingram.